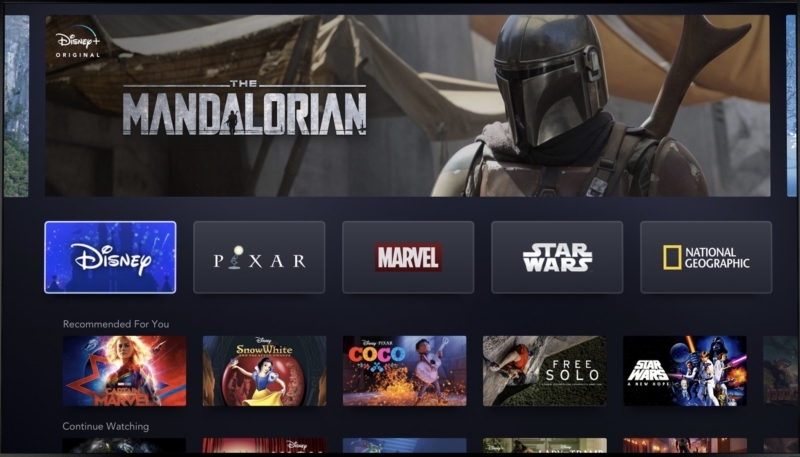 Disney on Thursday offered the first look at its upcoming Disney+ streaming service, delivering a peek at what features will be included. Disney CEO Bob Iger shared the screenshot via Twitter. The app will offer Disney shows and movies, and the interface will be similar to other streaming services, such as Netflix and Apple’s TV app. The screenshot shows off a dark mode-like interface, with the option to view the content from the various Disney-owned franchises, such as Marvel, Pixar, Star Wars, and more. The usual “Continue Watching” and “Recommendations” features are also included. Disney fans will be able to access the new streaming service via the app on any device platform you can usually view popular streaming services, including web browsers, smart TVs, tablets, smartphones, and game consoles. Disney will offer shows and movies in 4K HDR as well as HD. Each user in a household will have their own individual profile and content will be available for download for offline viewing. In addition to existing Disney content, the new streaming service will also feature content developed specifically for the service. New shows will include “Falcon and Winter Soldier” based on two popular Avengers characters, “WandaVision” with the Scarlet Witch (Wanda Maximoff) and The Vision, a show based on “Monsters, Inc.,” a show based on “High School Musical,” a Frozen 2 documentary, a Star Wars series, and much more. While Disney may offer bundled content from their other properties, such as Hulu and ESPN+, no details are currently available. The Disney+ service is scheduled to launch on November 12, 2019, and it will be priced at family friendly $6.99 per month, or users can score a discount if they opt to pay annually, where the price drops to $69.99 per year. The service will roll out to various countries over the next two years.